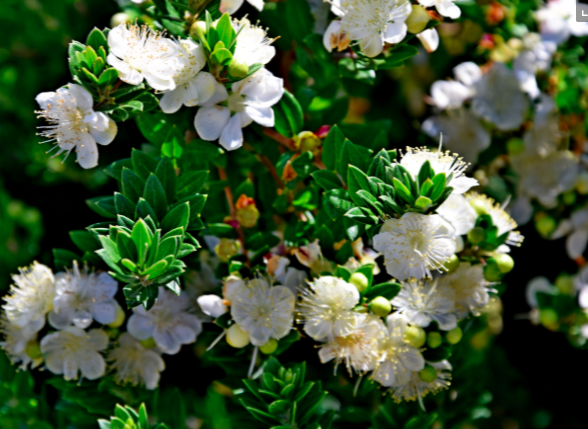 Dense, dark green and aromatic this form of sweet myrtle is also extraordinarily hardy to cold when established. Small glossy deep green foliage is sweetly fragrant when disturbed. Its held densely on upright stems on a compact growing shrub for full sun, a hot position and average to poor well drained soil. In late summer its decked in white flowers with conspicuous protruding stamens. They are sweetly fragrant and turn into WHITE berries by autumn. 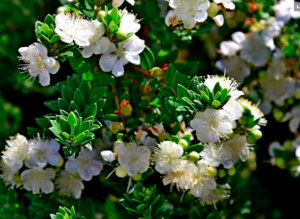 This shrub is best in a protected hot spot with as little summer water as possible when established. Too much summer water leads to rank growth that does not harden in time for winter cold. Grow this shrub lean and mean and its perfectly hardy to cold. It can take any amount of summer drought. Slow growing to on average 3′ x 3′ and rounded in 5 years- larger with time and larger in richer soil. Full hot sun all day and good air circulation. Basically plant your myrtle, water it and then leave it strictly alone. Moderate deer resistance.